Be sure to use only the recommended lubricants. Maintain the correct adjustment of the front bearings and repack them in accordance with the Periodic Service Schedule or if a bearing replacement is required. Routine examination of the tires will provide indications if an alignment is required. Grease the rack ball joint. Wipe off old grease that is forced out of rubber boot. Lift the front of the vehicle and support on jack stands. Rotate the front wheel and feel for any roughness. While holding spindle with one hand, grasp bottom of tire with other hand and rock tire back and forth on spindle. If excess movement is detected, the wheel bearing may require repacking and adjusting or replacement. If the wheel bearing is satisfactory, a worn spindle bearing, which is not a serviceable item, is indicated and the spindle must be replaced. Remove hub from spindle and disassemble. Clean all bearings, grease seal, hub and dust cap in solvent and dry thoroughly. Inspect for signs of damage. Pitting or a blue coloration of the rollers will require replacement of the bearing. If the roller portion of the bearing is to be replaced, the race must also be replaced. of grease be placed in the palm of the hand and the bearing be dipped in the grease. Force the grease up through and around all of the rollers until the entire bearing is saturated in grease. Assemble hub and install on spindle. If performing a wheel bearing adjustment only, lift and support front of vehicle. Remove dust cap and cotter pin and loosen castellated nut. 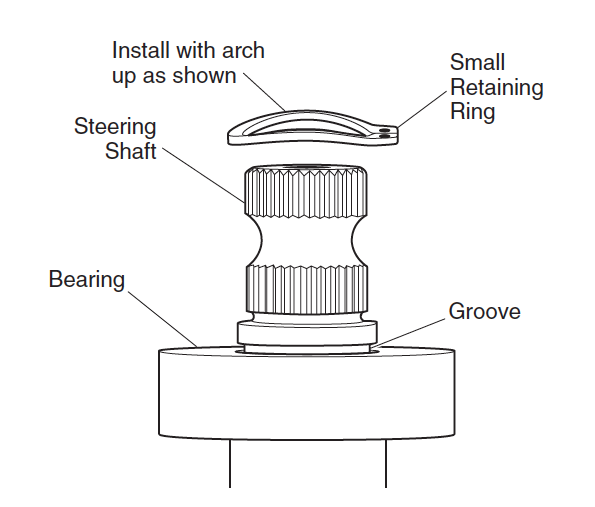 If performing a wheel bearing adjustment as part of another procedure, make sure wheel is mounted to hub hand tight with lug nuts and hub is loosely retained on spindle with castellated nut. Seat bearings by rotating wheel while tightening castellated nut until slight resistance is felt. Rotate the wheel 2 – 3 more turns to displace excess grease. If required, tighten castellated nut again until slight resistance is felt. If the cotter pin hole in the spindle aligns with a slot in the castellated nut, insert a new cotter pin. If the hole does not align, the castellated nut must be loosened to align with the closest available slot in the nut. Check for smooth and free rotation of the wheel and an absence of play when the wheel is grasped by the outside of the tire. Bend the cotter pin against the flats of the castellated nut. Replace the dust cap and lower vehicle. Lift the front of the vehicle and support on jack stands. Confirm the alignment of the front springs. Rotate each wheel and scribe a chalk line around the circumference of the tire at the center of the tread pattern. Lower vehicle and, with tires in the straight ahead position, roll it forward approximately five feet in order to allow the tires to take their normal running position. 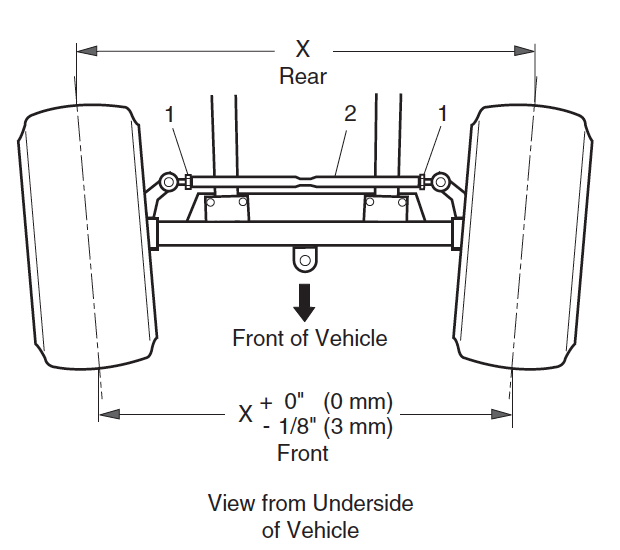 Measure the distance between the chalk lines at both the front and rear of the tires The measurement taken at the front of the tires should be 0″ – 1/8″ (0 – 3 mm) less than the rear. To adjust wheel alignment, loosen tie rod jam nuts and turn tie rod until correct alignment is achieved. Tighten jam nuts to 36 – 40 ft. lbs. (49 – 54 Nm) torque. Test drive vehicle and confirm steering wheel is correctly centered. 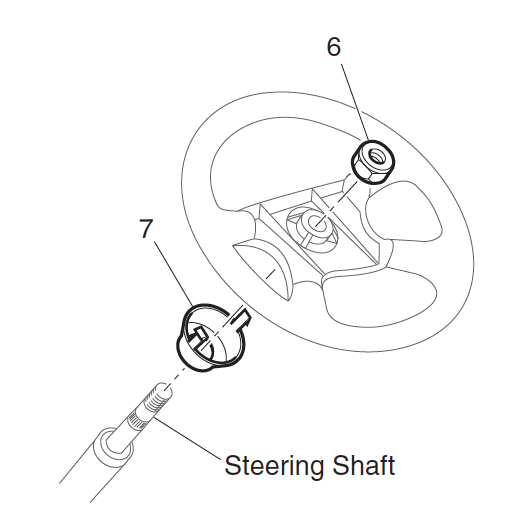 If it is not centered, disconnect intermediate shaft from steering shaft and center steering wheel. Reconnect intermediate shaft and tighten bolt to 155 – 215 in. lbs. (18 – 25 Nm) torque. Remove the nut from the bottom of the shock absorber at the front axle. Compress shock absorber to clear the mounting bracket. Loosen the nut securing the top of the shock absorber to the vehicle frame and then rotate the shock absorber while holding the nut in place with a wrench. Remove the shock absorber. Installation of shock absorber is reverse of disassembly. Mounting nuts should be tightened until rubber bushings expand to diameter of shock absorber washers. Remove front wheels. Remove fittings securing the shock absorbers to front axle. On the driver side, remove lock nut and washer from bolt and discard nut. Pull bolt and washer from spindle and separate spindle from axle. Remove thrust washer and king pin tube from spindle, wrap towel around spindle and let spindle rest on ground. Repeat at passenger side letting rack ball joint rest on front spring to support spindle. Remove hardware securing rack and pinion unit to front axle and discard lock nuts. Move rack and pinion unit back to rest on top of front springs. Secure rack and pinion unit to spring with wire to prevent pulling apart intermediate shaft. Remove the three 1 3/4″ long bolts, two 1 1/2″ long bolts, spring plate and five lock nuts securing axle to springs and discard lock nuts. At the 3 1/2″ long bolt securing front of left spring, note location of washer and remove it from end of bolt. Remove nut, 3 1/2″ long bolt, spring plate and spacer and retain them for assembly at their original locations. Front axle installation is the reverse order of disassembly using new lock nuts. All hardware must be installed in its original location. Tighten leaf spring and rack and pinion unit hardware to 35 – 50 ft. lbs (50 – 70 Nm) torque. Install thrust washers, king pin tubes, spindles, washers and bolts. Tighten new lock nuts to 56 – 70 ft. lbs. (75 – 95 Nm) torque. Check that spindle turns freely on king pin tube after tightening. Tighten shock absorber mounting hardware until rubber bushings expand to diameter of shock absorber washer. Check front wheel alignment and adjust if necessary. The following procedure will replace one spring at a Time. Loosen front wheels. Lift and support front of vehicle. In addition, support front axle with jack stands. Remove front wheels. Fully loosen the two rack and pinion unit lock nuts, one near the bellows and one on the rear side of the rack and pinion unit, until only one thread is engaged. Remove the lock nut and washer from the long bolt and discard lock nut. The rack and pinion unit is now loose. 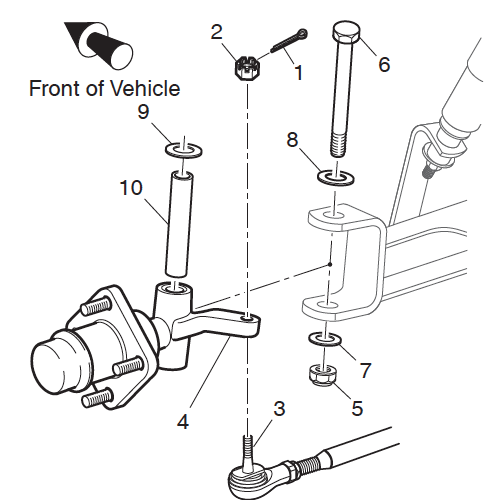 Remove the two 1 3/4″ long bolts and lock nuts securing driver side spring to axle and discard lock nuts. Hold nut with wrench and loosen long bolt. Note location of washer and thread long bolt out as far as possible to remove the washer, nut and spacer. Then pull long bolt and spring plate (24) from axle and spring. Retain above items for assembly at their original locations. Pull upper driver side of floor mat out of plastic trim retainer and away from floor. Locate and remove hardware securing rear of spring to vehicle frame and discard lock nuts. Driver side spring installation is the reverse order of disassembly making sure to install the long bolt, spring plate, spacer, nut and washer in their original locations. Use new lock nuts to secure the rack and pinion unit, two short bolts and rear bolts. Remove the hardware securing the front of the passenger side leaf spring to the axle and discard lock nuts. Pull upper passenger side of floor mat out of plastic trim retainer and away from floor. Locate and remove hardware securing rear of spring to vehicle frame and discard lock nuts. Using new lock nuts, install passenger side spring in the reverse order of disassembly. When front springs are replaced, the front axle must be aligned to the frame. The distance from the center bolt at rear of left spring to the center bolt at front of right spring must be the same as the distance from the center bolt at rear of right spring to the center bolt at front of left spring. 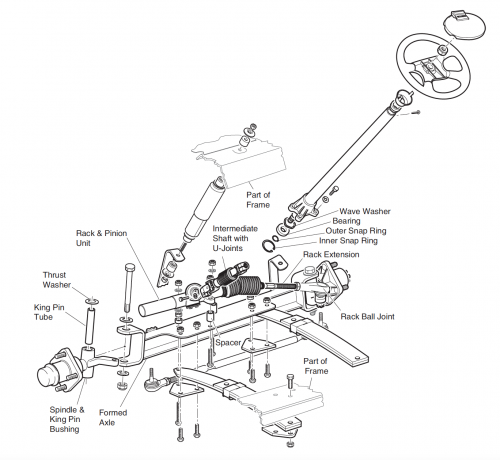 Tighten the spring hardware first and rack and pinion unit hardware next to 35 – 50 ft. lbs. (50 – 70 Nm) torque. Replace upper portion of floor mat in plastic trim retainers. Install front wheels and lower vehicle. Check front wheel alignment and adjust if necessary. Loosen front wheel(s). Lift and support front of vehicle and remove front wheel(s). Remove the dust cap, cotter pin and castellated nut. While holding outer wheel bearing in place, slide hub from spindle and discard. Clean spindle and new hub thoroughly with solvent. Pack new bearings with grease. Apply a light coat of grease to inner race and place inner wheel bearing in hub. Orient new grease seal so the flange side of the seal is facing into the bore. Tap gently into place until seal is flush with end of hub. Lubricate lips of seal and spindle with grease. Place new hub onto spindle and fill the area between the two wheel bearings about 1/2 – 3/4 full with grease and apply a light coating to the outer bearing race. Install outer wheel bearing and secure hub loosely with castellated nut. Place wheel onto hub and hand tighten lug nuts. Adjust bearing. Replace the dust cap. 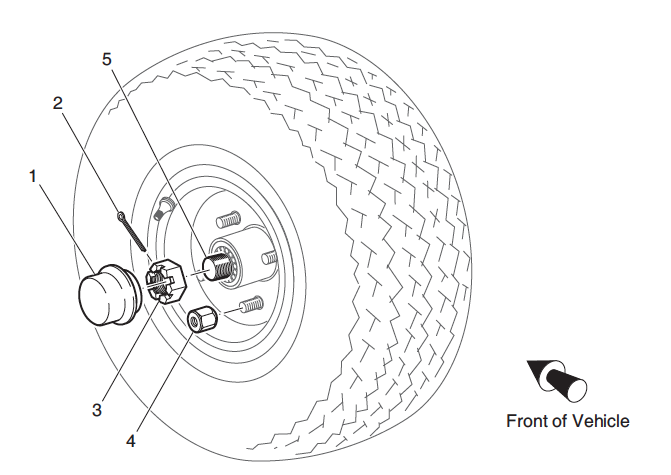 Lower vehicle and tighten front wheel(s). Remove hub from spindle. Remove the grease seal, inner wheel bearing and bearing races by tapping, through the other side of hub, the bearing race using a hammer and a soft nonferrous punch. Tap race in a circular pattern while moving from side to side to avoid damaging bore of hub. Clean outer wheel bearing, inner wheel bearing, hub and dust cap in solvent and dry thoroughly. Inspect for signs of damage. Pitting or a blue coloration of the rollers requires replacement of the bearing. If the roller portion of the bearing is to be replaced, the race must also be replaced. To install race, make sure bore of hub is clean and place new race over bore of hub. Evenly tap with hammer and bearing driver to drive race fully in bore. Repeat on other side of hub. Clean spindle and pack new bearings with grease. Install inner wheel bearing and new grease seal in hub and mount hub to spindle. Adjust bearing. Replace the dust cap. Lower vehicle and tighten front wheel(s). To remove rack ball joint, loosen passenger side front wheel and lift and support front of vehicle. Remove passenger side front wheel and turn steering wheel fully to the left. Remove the cotter pin and loosen the castellated nut until rack ball joint threads are protected. Using a ball joint separator as a lever, apply pressure to ball joint and tap nut with plastic faced hammer to release ball joint from passenger side spindle arm. Remove nut from ball joint and ball joint from spindle arm. 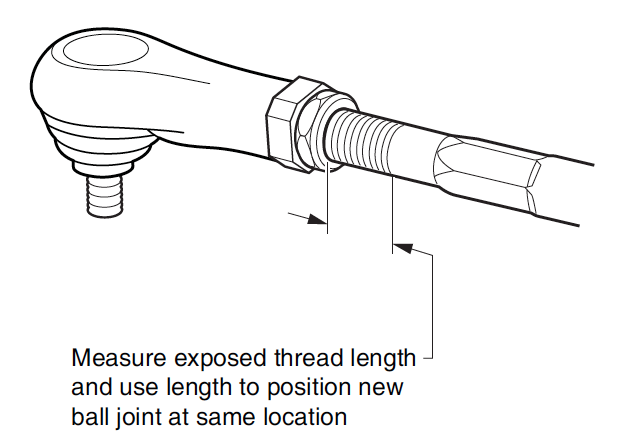 To install new rack ball joint close to its correct position, measure amount of threads exposed from jam nut. Loosen jam nut and remove rack ball joint from rack extension. Using measurement made earlier, thread jam nut and new rack ball joint to previous location on rack extension and set jam nut hand tight. Attach rack ball joint to spindle arm. Tighten castellated nut to 36 ft. lbs. (50 Nm) torque and continue to tighten as needed to insert new cotter pin. Maximum torque is 50 ft. lbs. (70 Nm). Check for proper rack extension-to-rack and pinion unit clearance before tightening jam nut to 35 – 45 ft. lbs. (47 – 61 Nm) torque. Install passenger side front wheel. Check front wheel alignment and adjust if necessary. Grasp the tie rod at ball joints and check for any vertical motion which would indicate a worn condition and require replacement. 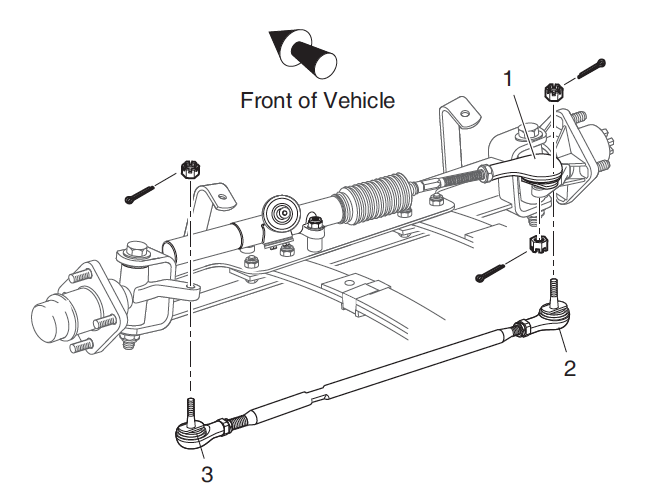 To remove tie rod, loosen wheel(s) and lift and support front of vehicle. Remove front wheel. 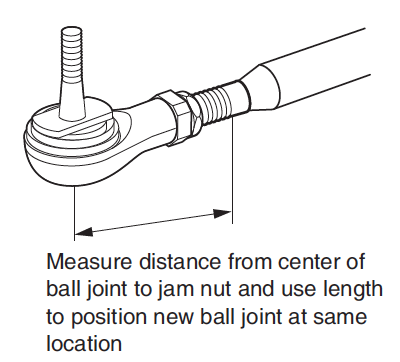 To install new tie rod ball joint close to its correct position, measure distance to center of ball joint from jam nut. Remove cotter pin and loosen castellated nut until tie rod ball joint threads are protected. Using a ball joint separator as a lever, apply pressure to ball joint and tap nut with plastic faced hammer to release tie rod from spindle arm. Remove nut to drop tie rod from spindle arm. Unscrew tie rod ball joint and jam nut from threaded tube. To install ball joint, first thread on new jam nut and then, using measurement made earlier, screw ball joint to previous location in threaded tube. Set jam nut hand tight. Install rubber boot and attach tie rod to spindle. The castellated nut should be tightened to a minimum of 36 ft. lbs. (50 Nm) torque and continue tightening as required in order to insert a new cotter pin. Maximum torque is 50 ft. lbs. (70 Nm). A worn tie rod is likely to have caused incorrect wheel alignment. Check front wheel alignment and adjust if necessary. Jam nut should be tightened to 36 – 40 ft. lbs. (49 – 54 Nm) torque. To replace bellows, first loosen passenger side front wheel and lift and support front of vehicle. Remove passenger side front wheel and turn steering wheel fully to the left. Remove rack ball joint and jam nut from rack extension. Cut wire ties and slide bellows off rack extension. Install new bellows aligning small end over groove in rack extension and secure with new wire tie. Leave large end loose until rack extension-to-rack and pinion unit clearance is checked or adjusted. Install jam nut and rack ball joint on rack extension and reattach to spindle arm. Check for proper rack extension-to-rack and pinion unit clearance before tightening jam nut to 35 – 45 ft. lbs. (47 – 61 Nm) torque. Install passenger side front wheel and lower vehicle. Check front wheel alignment and adjust if necessary. To access the pinion seal, remove rack and pinion unit from vehicle. Anchor in vice by clamping on the mounting ears of the rack and pinion unit. 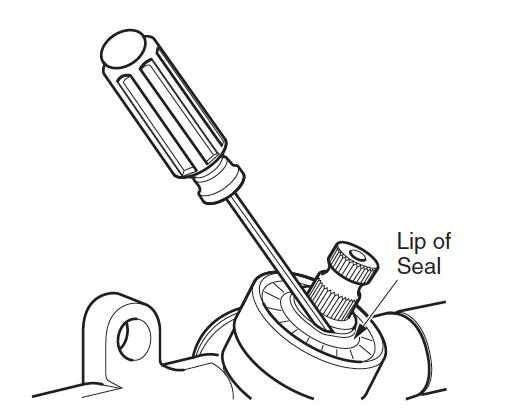 Slide a small straight blade screwdriver between lip of seal and pinion and pry top portion of seal up to remove. Use screwdriver to lift inner portion of seal up and off pinion. Check pinion surface for roughness and sand lightly if needed. Wipe bore clean and lubricate pinion and lip of seal with grease. Place seal over pinion and tap carefully with socket and hammer to start seal straight in bore. Drive seal fully into bore until it stops and wipe clean of any excess grease. Attach rack and pinion unit to front axle. Loosen front wheel. Lift and support front of vehicle and remove front wheel. 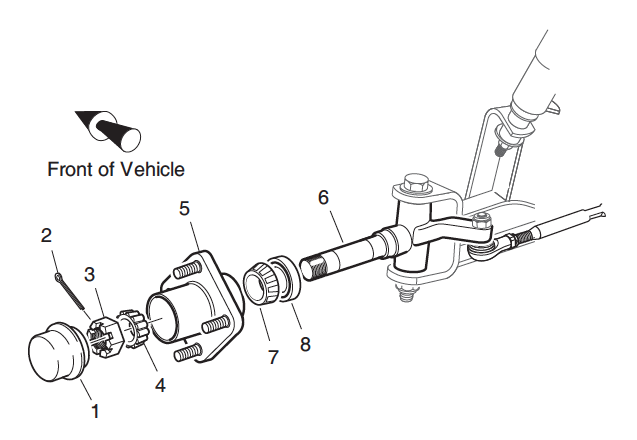 Remove cotter pin and loosen castellated nut until tie rod ball joint threads are protected. Using a ball joint separator as a lever, apply pressure to ball joint and tap nut with plastic faced hammer to release tie rod from spindle arm. Remove nut from tie rod and tie rod from spindle arm. If removing passenger side spindle, repeat previous step for rack ball joint. Remove lock nut and washer from bolt and discard nut. Pull bolt and washer from spindle and separate spindle from axle. Remove thrust washer and king pin tube from spindle. 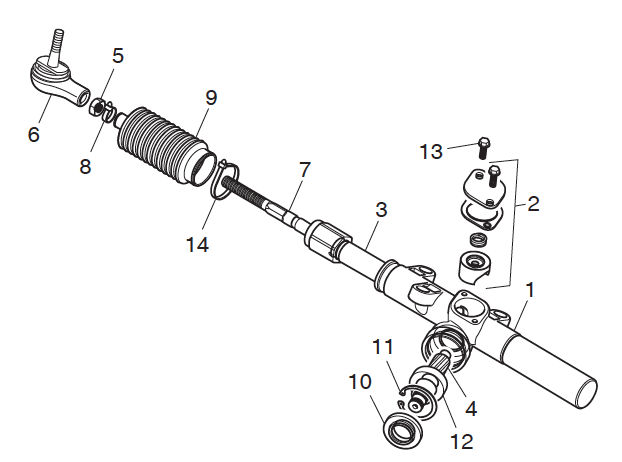 Spindle installation is the reverse order of disassembly. Tighten new lock nut to 56 – 70 ft. lbs. (75 – 95 Nm) torque. Check that spindle turns freely on king pin tube after tightening. Tighten castellated nut to 36 ft. lbs. (50 Nm) torque and continue to tighten as needed to insert new cotter pin. Maximum torque is 50 ft. lbs. (70 Nm). Install front wheels and lower vehicle. Check front wheel alignment and adjust if necessary. Remove rack and pinion unit from vehicle. Anchor in vice by clamping on the mounting ears of the unit. 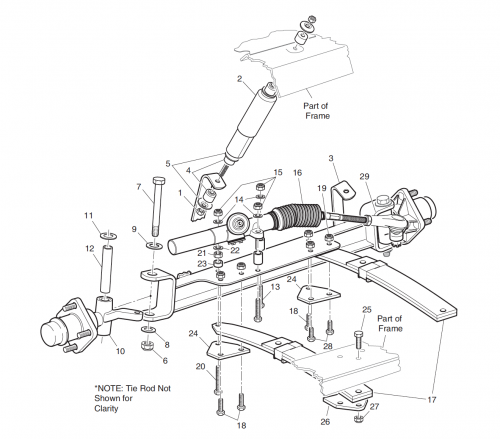 Disassemble rack and pinion unit by first removing screw and tensioner to relieve pressure on rack and pinion. Loosen jam nut and remove rack ball joint from rack extension. Cut wire ties securing bellows and slide bellows off rack extension. Pull rack from unit. Remove pinion seal. Remove internal retaining ring from rack and pinion unit and pull out pinion and ball bearing as an assembly. Clean rack, pinion and housing. Inspect gear teeth, bearing surfaces and grease seal surfaces of rack and pinion for excessive wear or damage. 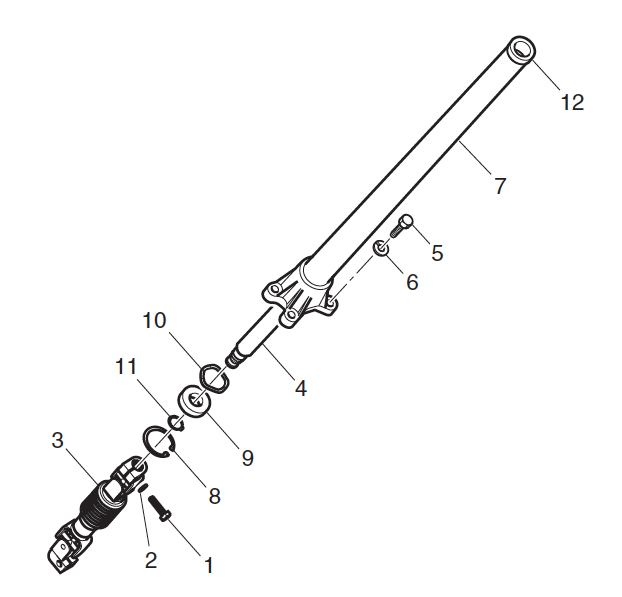 If any is found, the rack and pinion unit must be replaced as an assembly. If rack and pinion pass inspection, clean them, tensioner and housing thoroughly and lubricate for assembly. Use grease specified in tool list. Assemble rack and pinion unit by first installing pinion in reverse order of removal making sure to lubricate pinion seal lip prior to installing seal. Insert rack into rack and pinion unit. Turn pinion clockwise to help pull rack in if necessary. Install bellows and secure to rack extension with wire tie. Do not secure large end of bellows to rack and pinion unit until instructed to do so after setting proper rack extension-to-rack and pinion unit clearance. Install tensioner and tighten bolts to 100 – 120 in. lbs. (11.5 – 13.8 Nm) torque. Thread jam nut and rack ball joint to original location on rack extension and set jam nut hand tight. 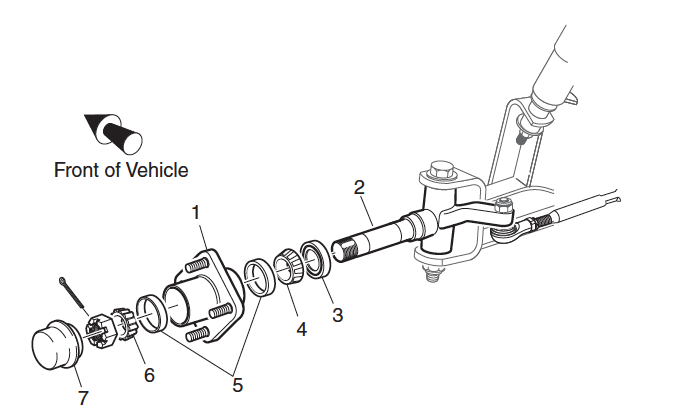 Install rack and pinion unit on vehicle. Set proper rack extension-to-rack and pinion unit clearance. 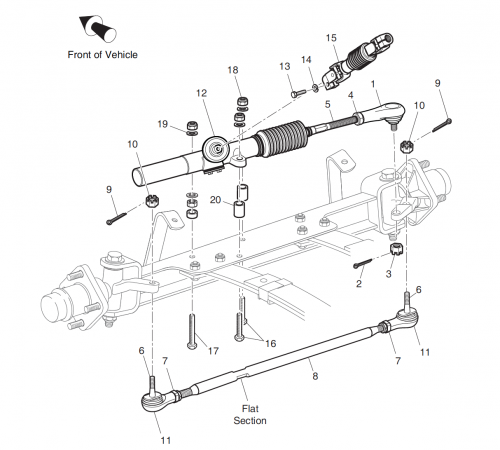 To remove rack and pinion unit, loosen front wheels and lift and support front of vehicle. Remove front wheels. Remove bolt and washer securing intermediate shaft to rack and pinion unit. Remove cotter pin and loosen castellated nut until rack ball joint threads are protected. Using a ball joint separator as a lever, apply pressure to ball joint and tap nut with plastic faced hammer to release ball joint from passenger side spindle arm. Remove nut from ball joint and ball joint from spindle arm. Remove the three lock nuts securing rack and pinion unit to front axle and discard nuts. The rack and pinion unit can now be removed from vehicle. Retain washers, spacers and the two bolts for assembly. Replace rack and pinion unit in reverse order of removal. Use new lock nuts and tighten them to 35 – 50 ft. lbs. (50 – 70 Nm) torque. Tighten castellated nut to 36 ft. lbs. (50 Nm) torque and continue to tighten as needed to insert new cotter pin. Maximum torque is 50 ft. lbs. (70 Nm). Tighten bolt securing intermediate shaft to pinion to 155 – 215 in. lbs. (18 – 25 Nm) torque. Set proper rack extension-to-rack and pinion unit clearance. Install front wheels and lower vehicle. Check front wheel alignment and adjust if necessary. 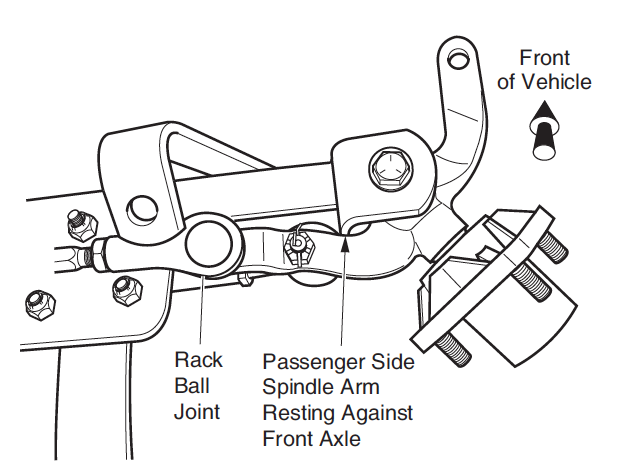 Check for proper rack extension-to-rack and pinion unit clearance by first turning steering wheel fully to the right. The rear spindle arm on the passenger side must rest against the front axle. If it does not, all adjustment is made at the rack ball joint. Loosen jam nut at rack ball joint and use wrench to thread shaft of rack extension further into rack ball joint. This will provide more travel for the steering wheel to be turned to the right. With spindle arm resting against front axle, cut wire tie securing bellows to rack and pinion unit and slide bellows away from rack and pinion unit to see large hex of rack extension. 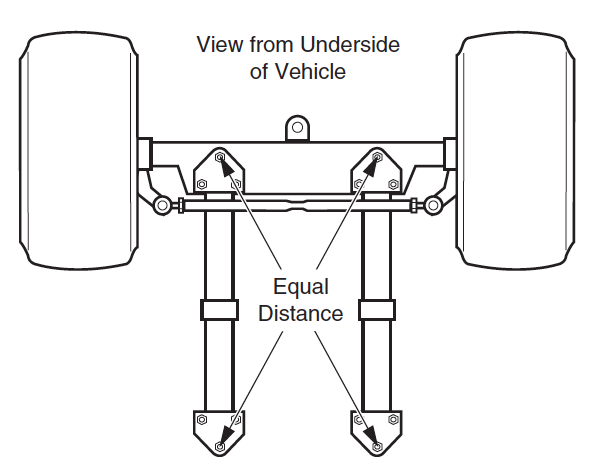 An 1/8″ gap should exist between the large hex and the end of the rack and pinion unit. 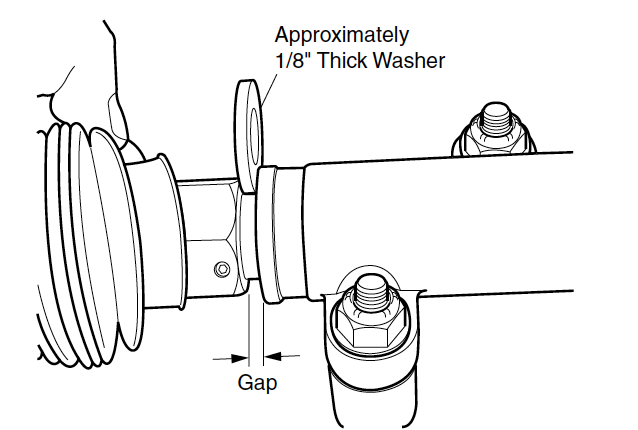 Adjust, using an 1/8″ thick washer as a gauge, by turning shaft of rack extension with wrench to create the 1/8″ gap. Tighten jam nut to 35 – 45 ft. lbs. (47 – 61 Nm) torque. Secure bellows to rack and pinion unit with new wire tie. From the front side of the steering wheel, remove the clipboard by first pulling straight up on the bottom of the clipboard to release the two bottom retaining tabs. Then, using thumb for leverage as shown, reach from behind steering wheel with fingertips to first pull down, and then push up to release the two top clipboard retaining tabs. 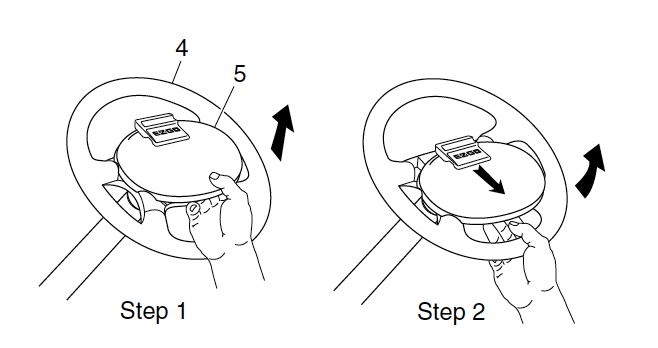 Loosen the steering wheel retaining nut two to three turns. DO NOT REMOVE NUT AT THIS TIME. Apply upward pressure to the steering wheel. Place a plastic faced hammer against the steering wheel nut and strike plastic faced hammer sharply with a ball peen hammer. When steering wheel is loosened, remove retaining nut and remove steering wheel. Prior to replacement, assemble the replacement steering wheel by aligning the retaining tabs on the rear collar hub with slots in back of steering wheel. Squeeze tabs to allow insertion of hub. Do not force. Squeeze hub on top and bottom to fully seat. Replace steering wheel by first lightly coating the splines of the steering shaft with a commercially available antiseize compound. With the vehicle wheels in the straight ahead position, align the steering wheel on the steering shaft and slide wheel on shaft. Tighten the steering wheel nut to 15 – 20 ft. lbs. (20 – 27 Nm) torque. Inspect the four retaining tabs on the clipboard for white stress lines. If stress lines are present, replace clipboard. Install by carefully pressing, first the top two, then the bottom two retaining tabs into the matching slots in steering wheel. To remove steering shaft remove the steering wheel. Loosen front wheels. Lift and support front of vehicle and remove front wheels. Remove the bolt and washer that secures the intermediate shaft to the steering shaft. Remove the four bolts and washers that secure the steering column to the chassis and remove the column. Remove large retaining ring on bottom end of column and pull shaft and bearing out as an assembly. Slide wave washer out bottom end of steering column and keep for reuse. Remove small retaining ring and press bearing from steering shaft. To assemble steering shaft, first press new bearing onto shaft until it stops against shoulder. Then, with small retaining ring oriented with arch up, slide ring onto shaft as far as possible using snap ring pliers. Use fingers to push retaining ring fully into groove. Slide wave washer into base of steering column. To install steering shaft and bearing assembly, apply wheel bearing grease to lip of seal in bushing at top of column and press steering shaft and bearing assembly into column base. Secure with large retaining ring making sure it is fully seated in groove of column. 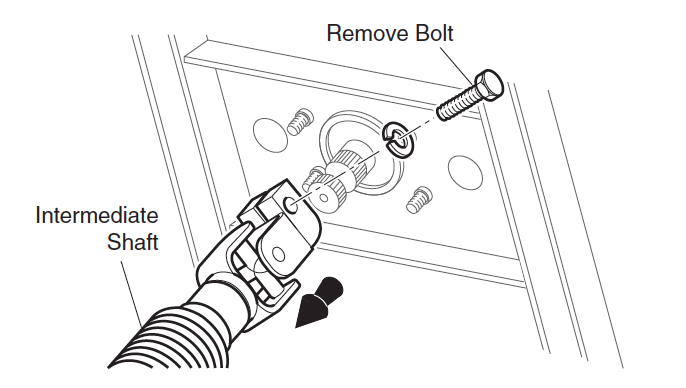 Place steering column on vehicle and tighten column bolts to 29 ft. lbs. (39 Nm) torque.